Is it possible to own too many tartan skirts? Well, perhaps I'm just being indulgent by holding onto five of the beauties - all second hand and purchased within the last year. However, there is something quite compulsive not only about the quality of wool and promise of winter warmth, but also the chance to inject three (often clashing) colours into an outfit without even breaking a sweat. And besides, what was good enough for Alexander McQueen and Vivienne Westwood is good enough for me! This is my current favourite of the five - bought in that jumble sale. I feel like I'm talking about some kind of legend whenever I refer to it. "The mythical jumble sale full of vintage bargains that only takes place every 100 years in an undisclosed rural location.."
It's a proper vintage kilt (and yes, I know technically the pleats are meant to go at the back - let's call this artistic license), only slightly bigger than my waist. It probably would have been the right size when bought, but I think I either lost weight during surgery or my twice daily walk is putting my metabolism into overdrive. It's one of those items one looks at and thinks "Who would wear a full length kilt? And more to the point, when?" Ladies and Gentlemen I have the answer - me, today, in the snow. I wanted to dress it up 1940s-esque film star style - hence the thrifted short sleeved, ribbed polo neck and vintage gloves (inherited from my great-grandma). I then added a faux fur collar - found in our dressing up box - pinned with a cameo I bought for 25p at a bric-a-brac stall. The little vintage bag was bought at a market and the belt is charity shopped, as are the lace-up boots. The cardigan (worn over my shoulders in one shot) is a genuine great great-grandma hand knit, as that's who it belonged to! Another invaluable item for keeping me cosy this winter. This is the first time I've done a shoot for the blog since shortly after being discharged from hospital, and it felt quite comforting to be out in the snow, freezing my elbows off and posing almost like normal. Of course, it's not entirely back to the way it was before - that'll never happen. And at the moment walking down the road requires utmost concentration, as I don't want to slip over on the ice. And unfortunately no sledging for me this year. My mum took these photos in one of our most beloved spots, and if you look back through my archives you might see it pop up a few times (mainly because it's one of the nearest places for a few quick photos)... I love the way it looks at different times of year. It's back to London tomorrow for my six week post surgery check up. In some ways those six weeks have sped by, and in others it feels more like six months. I'm just going to reiterate how much it has meant to me to have such support from my blog readers, and thank you for every single lovely comment. Take a look at the newest pair of mummy's scissors, created by the lovely Jazz of Jazzabelle's Diary. I'm still amazed by all the variations and creative approaches people have taken. I really enjoyed reading the many insightful comments on my debate about the writing of poetry - and talking of poetry, I've just finished reading 'Resistance' by Owen Sheers (a poet turned novelist). For anyone who is a fan of Laurie Lee's descriptions or just enjoys beautiful writing and thought-provoking subject matter, I would highly recommend it. I am sooooooooo happy to see you out and about, posing for us in the snow, like the real fairy you are. Un abrazo my dear friend. I shall check Jazzabelle´s mummy scissors. I'm always so jealous of these amazing items you find! Not many could pull off a full length kilt but you have managed perfectly! I hope everything goes fine at your check up, you really are truly inspirational the way you have dealt with this. As always, amazing photographs! Love the jumper! wonderful to see you getting back to some semblance of normal! and no- one cannot own too many plaids. full length plaid? why not! i'm a big fan of tartan plaids, always. You look great in that tartan skirt. You've got that Ann Hathaway look. These photos are so ethereal and beautiful, and I love your outfit!! The tartan skirt is lovely, I have loads myself too. I think it's courageous to go out in the chilly weather when you "just" had a surgery. For I would not go out until a long, oh-so-very-long time if it was my case. aaa i love the new picture you put on the top !! so nice and fresh !! I love the gloves, and your hair is so beautiful. Glad to see you feeling well and looking gorgeous! The skirt is gorgeous! I don't know if I could pull it off, but you sure do! that skirt is stunning! your blog will always be one of my favorites. I love love love plaid skirts! :) they're my favorite. I also love tartan skirts and kilts! (Though sadly I feel a bit self conscious wearing them in Scotland.) Nice to know there are others out there. As always it is amazingly put together and you've recovered so well! Wow I love that skirt and the whole outfit! Wow. Beautiful! Who takes your photos for you? I have 4 myself. You've made me feel better about having so many and being still on the lookout for more. I love them because I can layer colours on top and layer leggings and socks etc. underneath all the pleats. So warm and so easy to curl up in. They make such a better alternative to pants. Although, I'm longing for some plaid (or as you say tartan) pants. You look beautiful against the snow. Hi I am Rose from mariposamoda.blogspot.com . I was wondering what size your main image is, the one at the very top with 'Clothes, cameras and coffee' written across it. Sarah and I have a huge image(!) which we really want to get the 'right' size :/ Thank you. Happy Christmas! we love your outfits and the photos are great too. I definitely have a taste for tartan now! You look beautiful and I am so glad your recovery is going well! :D Arn't kilts lovely! You pull them off so well! You are such a great beauty. I personally don't think ANYBODY could EVER own too much plaid, and your full length skirt is wonderful. I love the plaid of it too. Such bright and optimistic plaid. You are a pearl, a stunner in the snow, and your mom is really picking up her game photo-wise, lovely shots! I love tartan! You look great in that skirt! I hadn0t realized you were that tall. I could wear that skirt as a dress and it'd still be necessary to trim a few centimeters of fabric, hehe. It's great to see you out and posing for these photo shoots. For some reason, I didn't get any notification of your previous posts, so I'm looking at them all right now. we love you. keep inspiring us. your blog is always so inspirting and beautiful and you always have a story behind your outfit posts! you look like a model of the MAC tartan range adverts! love this! PS: giving away an anchor tee on my blog that i know you will love! i am really feeling the tartan look nowadays and I do rather like this outfit! You are absolutely beautiful ! I always find great inspiration in your blog. 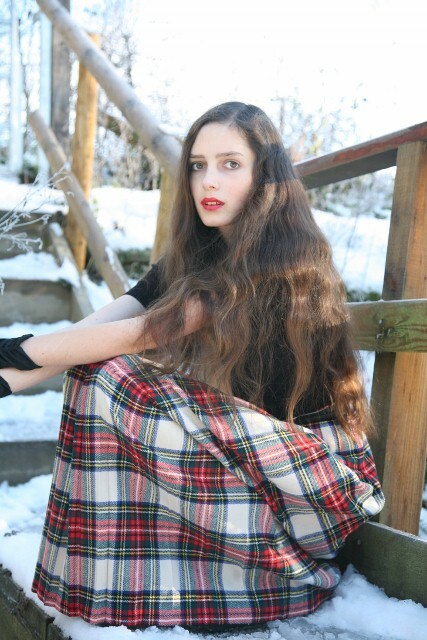 you look beautiful in the snow and the skirt is lovely ! i also love tartan! take care with your recovery! kisses from bucharest! Beautiful pictures! And no, you can't have too many kilts. They come in too many different colours and different lengths. was just passing thru and noticed this skirt...beautiful! 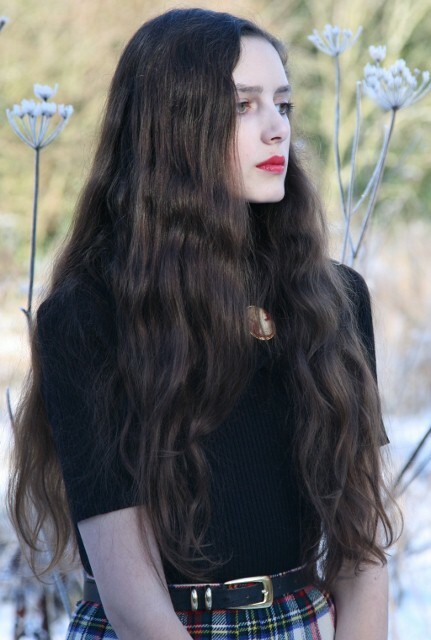 you have many great vintage pieces - love the long coat in the previous post as well. beautiful photographs roz, i adore your skirt, the length is fabulous on you! you really do look so much taller! i also have a taste for tartan at the moment, i found the most adorable vintage m&s st michael childrens duffle coat which fits me rather perfectly! the sleeves are a little short, but they look great rolled up. thank-you for linking by the way, i'm glad you liked the necklace! oh, even if you don't go to the v&a too much i would really recommend getting a student membership plus guest. the price would be around £35, and it enititles you to recieve the magazine every couple of months, unlimited free entry for you any other person to the exhibitions, member's previews and ten percent off in the gift shop and cafe!